NASA's Curiosity Mars rover held its arm in the same position for several days after a transient short circuit triggered onboard fault-protection programming to halt arm activities on Feb. 27, 2015. The short circuit that has stalled some of the science work by NASA's Mars rover Curiosity apparently originated in the robot's rock-boring drill, mission team members say. Curiosity experienced a current fluctuation on Feb. 27 while delivering some sample powder from the drill to instruments on the robot's body. The drill sits on the rover's 7-foot-long (2.1 meters) robotic arm. The rover hasn't moved the arm or its six wheels since, as engineers have focused on running tests to figure out what exactly happened. "The most likely cause is an intermittent short in the percussion mechanism of the drill," Erickson said in a statement. (Curiosity's drill doesn't simply rotate; it hammers into rock, via that percussion mechansism, as well.) "After further analysis to confirm that diagnosis, we will be analyzing how to adjust for that in future drilling." A brief short occurred during a test on Thursday (March 5) that used the drill's percussive action, NASA officials explained. "The rover team plans further testing to characterize the intermittent short before the arm is moved from its present position, in case the short does not appear when the orientation is different," they wrote in the statement. "After those tests, the team expects to finish processing the sample powder that the arm currently holds and then to deliver portions of the sample to onboard laboratory instruments." Curiosity may start moving its arm again as early as next week, NASA officials said. The 1-ton Curiosity rover landed on Mars in August 2012, on a mission to determine if the Red Planet has ever been capable of supporting microbial life. The rover's drill is key to this quest, allowing Curiosity to collect powdered samples from up to 2.5 inches (6.5 centimeters) deep within rocks. Indeed, Curiosity's analysis of drilled samples enabled mission scientists to determine that an area near the rover's landing site called Yellowknife Bay was a habitable lake-and-stream system billions of years ago. 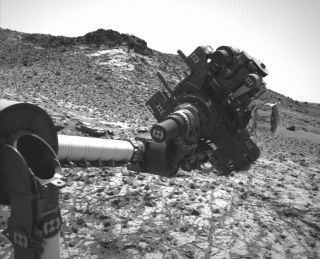 Curiosity snagged its latest sample from a rock dubbed Telegraph Peak, which lies at the base of the huge Mount Sharp in a region called Pahrump Hills. The rover has drilled into three separate rocks from Pahrump Hills, which Curiosity reached in September 2014. Mission scientists plan to send Curiosity up through the foothills of Mount Sharp, which rises about 3.4 miles (5.5 kilometers) into the Martian sky. Reading the rocks along the way should reveal a great deal about how the Red Planet's environmental conditions have changed over time, Curiosity team members say.